Poll Right, you lovely people, the moment has arrived to settle once and for all that matter of most monumentous moment: just what constitutes the ultimate bacon sarnie. As you'll recall, the porcine polemic kicked off when we pitched German delicacy Bauernfrühstück against the sacred pork-based assemblage in one of our post-pub nosh deathmatches. After considerable and heated reader debate, we invited photographic submissions of your contenders for the title. Those of you who weren't too hung over - or indeed still gobbing of in comments - rose magnificently to the challenge. Too magnificently, it must be said. Please spare a thought for this poor hack who had to wade through the bacon sarnie snaps, and only managed an hour before succumbing to the overwhelming urge to nip to the kitchen and knock together... a bacon sarnie. Another couple of hours of cropping and resizing your pics and the situation began to get serious, given that I'd blown my entire bacon supply on the first porkfest. I battled away until mid-afternoon, at which point it became impossible to continue in the face of a computer screen bursting with bacon goodness. Consider yourselves warned, then. I'd advise having the frying pan on standby before eyeballing our entries. 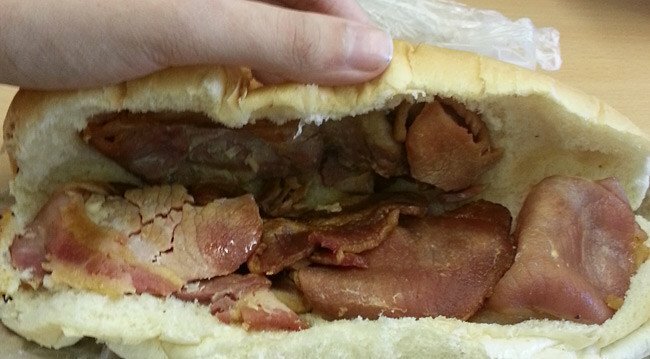 We kick off with Adam Egan, who presents a bacon jumbo from his local sandwich shop. 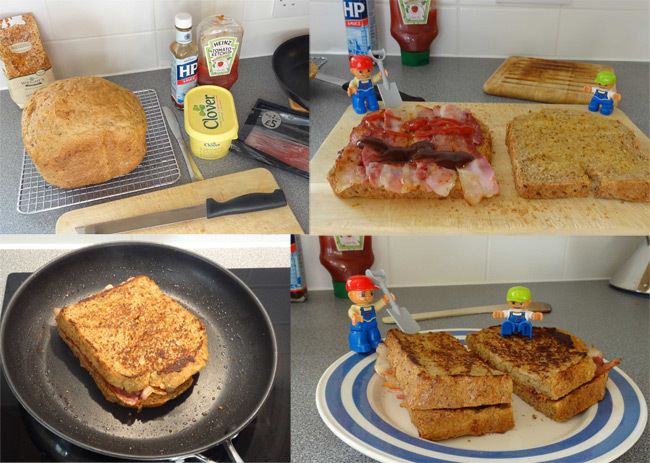 He said: "I add a little brown sauce and there you have it :) Not elaborate, but it is a bacon sarnie!" Another classic here from Neil Cardy, courtesy of the The Horn Cafe between Dundee and Perth on the A90. He explained: "Masses of bacon to set you up for the journey south." 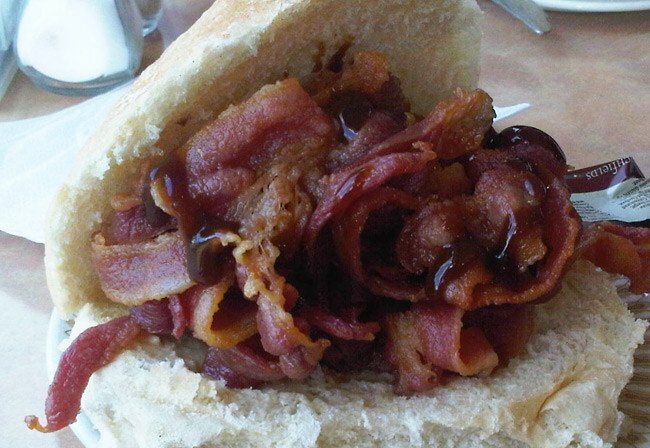 Note the brown sauce element. Bruce L described the substrate for his copious bacon creation as "some sort of seed-strewn wholemeal bap", which we're sure will go against him in the voting. 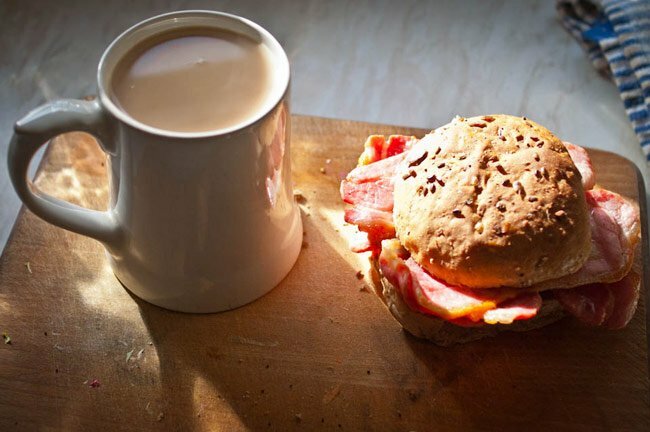 He did, however, wisely deploy butter, and noted that the essential accompaniment to the sarnie is a "giant mug of tea", which is "elevated from refreshing but basic hot beverage to nectar of the gods by simple application of: 1) any greasy food, in this case the bacon butty and 2) several pints too many of one's favourite ale." Reg regular Chris Winpenny declined to provide any description of his sarnie, but the nouvelle cuisine presentation leads us to suspect the involvement of Marco Pierre White, and that accordingly, this bacon creation will set you back £35. 1. Take an unsliced white sandwich loaf with thick soft crust and hand cut to 18mm slices. Lightly toast to an even golden brown. 2. Use 6 rashers of good quality smoked or sweet-cured back bacon and grill on both sides between two cooling racks until the fat is crispy. 3. 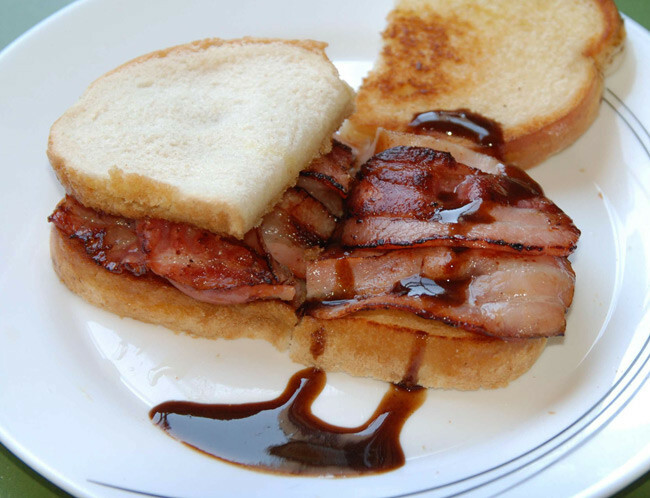 Using the best quality brown sauce you can find, squeeze a generous zigzag onto the bottom slice of toast using a narrow tipped squeezy bottle. 4. Lay 3 rashers alternating wide and narrow ends on the sauce, then repeat a second zigzag. Lay the second three rashers on top and add a third layer of sauce. 5. Finally top with the second slice and cut in half to make two oblong sarnies. "Serve with a cold glass of freshly squeezed orange to banish those hangover blues!" he enthused. Harvey Trowell provided a series of construction steps, as you can see. He elaborated: "This bad boy has Tommy K at one end and HP the other, as piggy likes it both ways. For that reason if no other, let's call it The Lindsay. What you are looking at is two slices of mixed grain bread hot from the bread maker machine, streaky dry cured oak smoked bacon fried until just beginning to crisp, spreadable butter substitute and sauces being applied, and the assembled sarnie returned to the frying pan for a final crisping up in the healthy goodness of the rendered bacon fat." 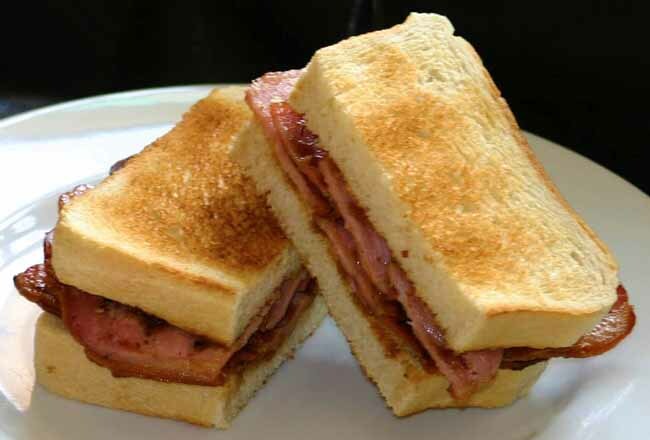 There's been plenty of polemic about the correct slice of pork for the ultimate bacon sarnie, but Alex Outten may have reached the perfect compromise, with "homemade sourdough bread (1 slice buttered, other with both sauces (NOT mixed), plus crispy streaky bacon layered with just heated back fillet bacon".